Fill with our green candy wafers for a lifelike addition to your dessert table. The Large Alligator has a realistic appearance and is a fun way to highlight your event. Each piece is 4" x 8-3/4"
I was very pleased with the promptness of the delivery timing and quality of the item ordered from Sweet Treat Supply. I would absolutely recommend buying from them, and would do so again in the future. Thank you, S.T.S.! 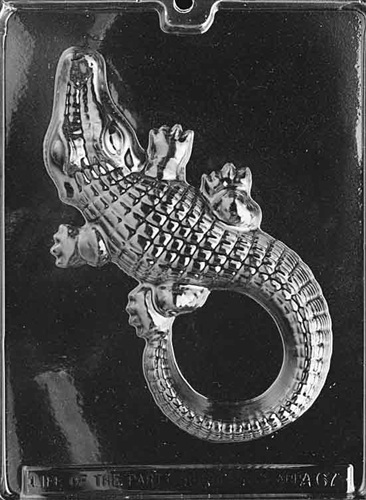 I did not start out with the intent to order an alligator mold, but there it was. This company has a plethora of fun and interesting molds, and this one takes the cake, or should I say confection! This will be a humorous mold for office parties and other functions. Can't wait to use it. Thank you for the great service as well!